Today at lunch, I braved the humidity and the Times Square crowd crawl to go to the Virgin Megastore (oh sadness, it's closing!) to buy some new earphones for my iPod. 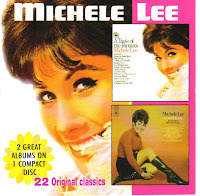 While I was there, I picked up the Michele Lee double album - A Tase of the Fantastic and L. David Sloan and Other Hits of Today. Oh my goodness. I've wanted this album for such a long time! Most people know Michele from that crazy cul-de-sac drama, Knots Landing, that was the big time spin off from Dallas in the 1980s. She played Karen and even one an Emmy for the role. But I love her for for her Broadway work, namely two songs - TWO GREAT BIG BROADWAY SONGS. One is I'm All I've Got from Bravo Giovanni, a stinker that ran for 72 performances at the Broadhurst in 1962, but oh what a great song this is. And Michele sang that hell out it. It's such a freedom song too. The other song is from SeeSaw, that ran 11 years later for 296 performances, first at the Uris then the Mark Hellinger. It's Nobody Does It Like Me. It's self-deprication at it's finest. Again, she sang the hell out it. I actually like this entire album. Ken Howard (The White Shadow!) and Tommy Tune were in it too. Michele was also a replacement as Rosemary Pilkington in How to Succeed in Business without Really Trying opposite Robert Morse before she did Bravo Giovanni. After I left Virgin, I stopped in the Broadway gift shop at the Marriott Marquis to pick up a Hairspray souvinir book for my niece Cara. She has been watching the movie and listening to the original cast recording nonstop over the last few weeks. I'm so proud. And you must check out this video: Dinah interviews the Merm about singing for George Gershwin, then Phil Silvers tells a story about how he and Rags Ragland helped burlesque comic Jack Diamond audition for "Kiss Me, Kate!" before Michele Lee sings Nobody Does It Like Me from Seesaw on this 1975 episode of Dinah Shore's "DINAH!" subtitled "Dinah Salutes Broadway Musicals." Robert Morse is there too. Thanks, Dinah! Cara has excellent taste. I love Hairspray, too! Does she like the Broadway cast album better than the movie soundtrack? Or does she listen to both of them? Gomezparkinson has MANY Dinah clips on YouTube. He, I believe, is the Dinah authority on that site. I had one of his clips as my pick o' the week not long ago. Thank you for sharing that clip! "Nobody Does it Like Me" has always sounded just like that other Coleman number, "You Can Always Count on Me." Both great, though.